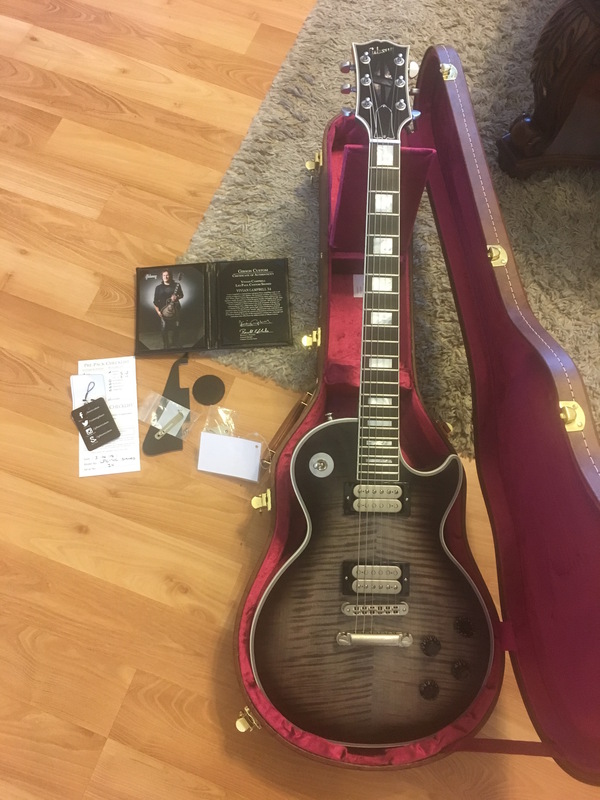 Gibson Limited Edition Custom Vivian Campbell Les Paul Custom Signed Edition #34 of 50 in new condition. 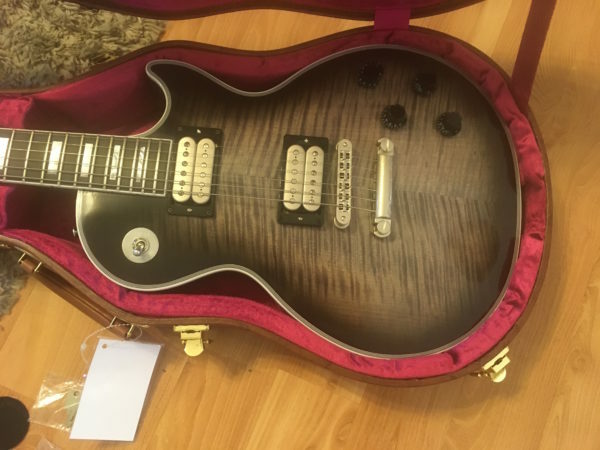 Completely Mint condition Gibson Vivian Campbell Les Paul Custom. 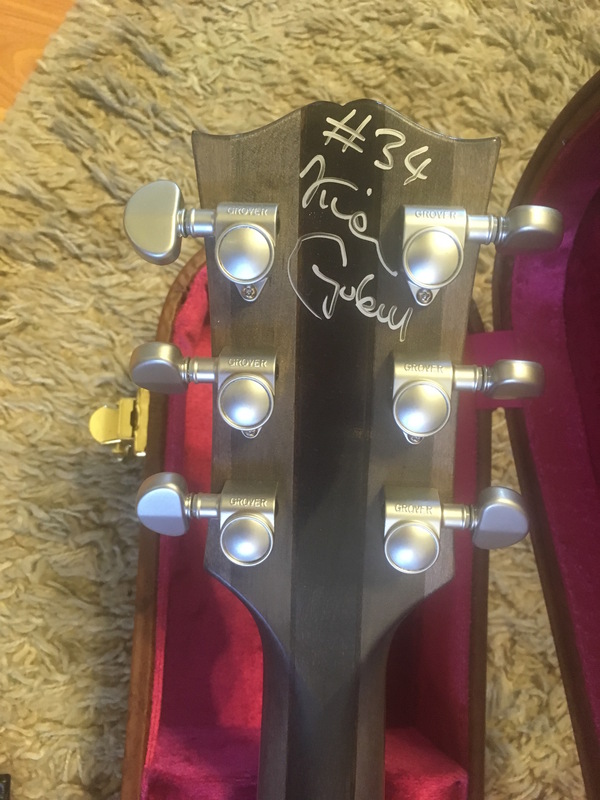 This is the Signed Edition, #34 of only 50 made world-wide. Comes with everything you get new including the cardboard shipping box! 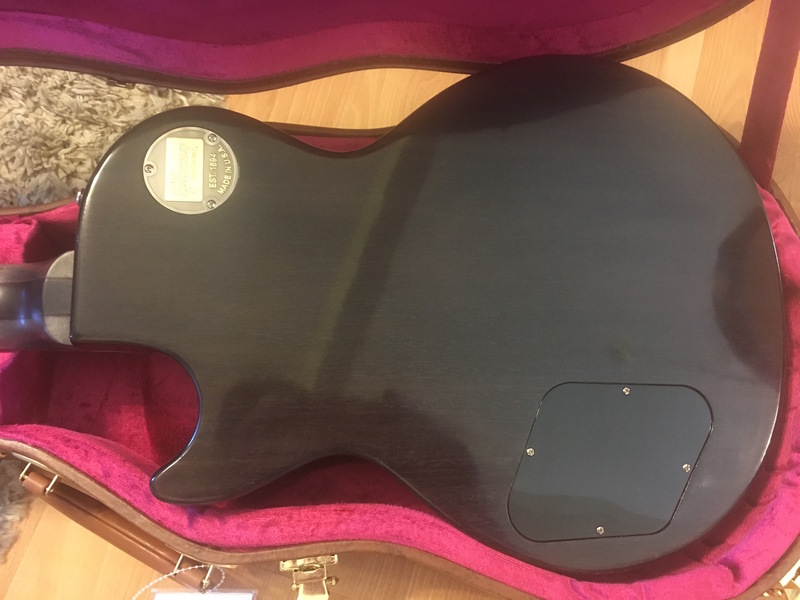 Guitar is unplayed but set up and ready to go. 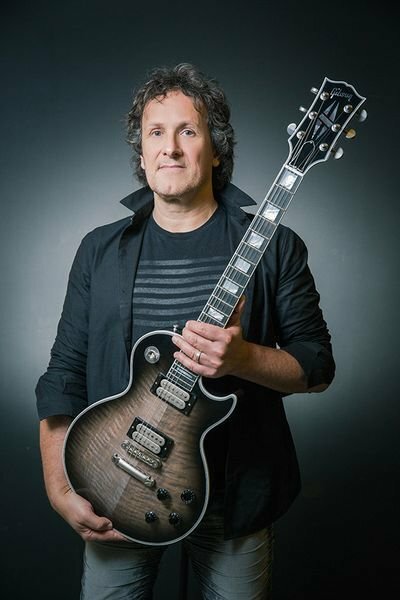 Vivian Campbell is a musical tour de force, and his signature Les Paul Custom is as impressive as the man himself. 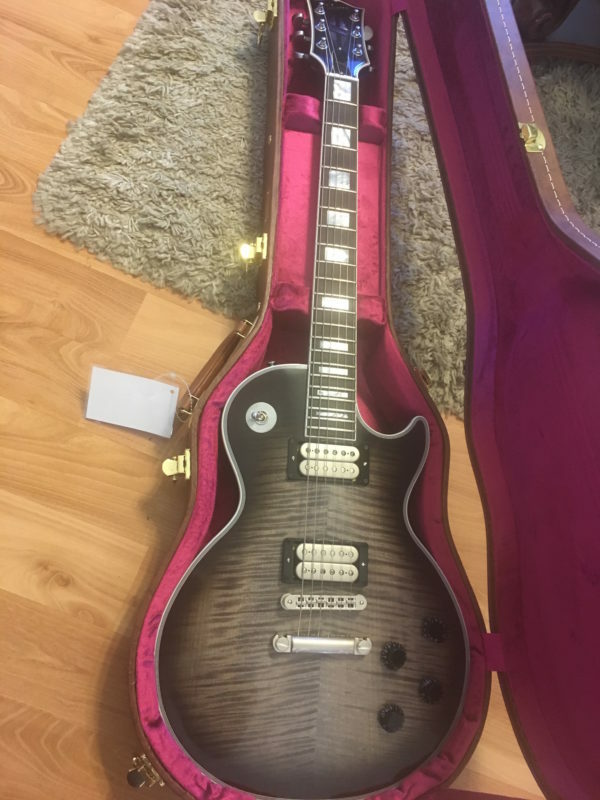 Its resonant mahogany body features an eye-catching figured maple top and distinctive Antrim Basalt Burst finish. Its 5-piece maple/walnut neck boasts a comfortable slim-to-medium 1970s C-shaped profile and a fast-playing richlite fingerboard. Chew on a thick slice of high-gain heaven, thanks to twin DiMarzio humbuckers. Beyond that, this guitar is loaded with premium parts including CTS pots, Orange Drop capacitors, a handwired harness, and Switchcraft toggle switch. 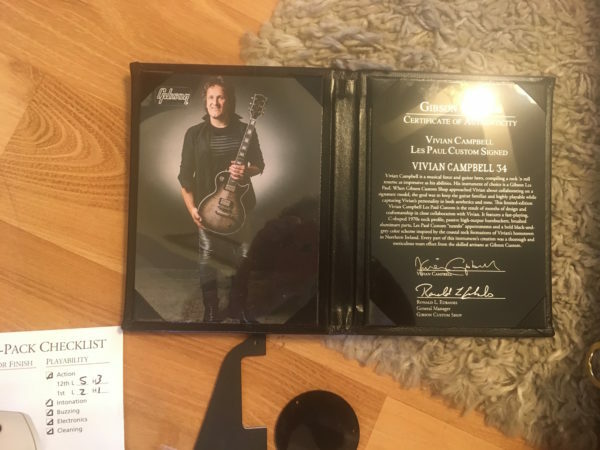 The Gibson Vivian Campbell Les Paul Custom is limited to 250 guitars worldwide. 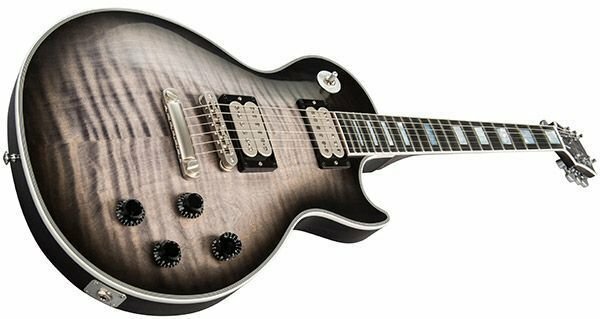 The Vivian Campbell Les Paul Custom sports a comfortable, fast-playing neck with a slim-to-medium 1970s C-shaped profile. 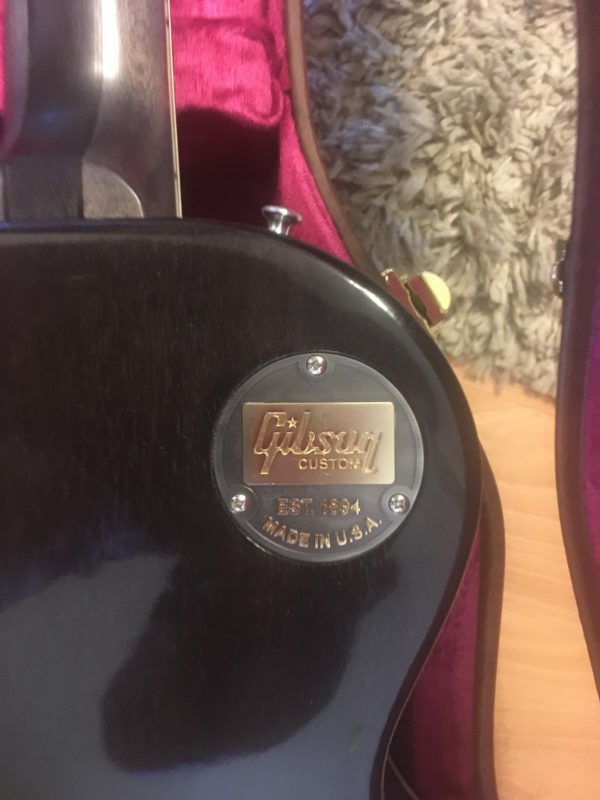 Early Les Paul guitars had huge “tree-trunk” necks, but in 1959, the company began slimming the neck down to a more comfortable size. 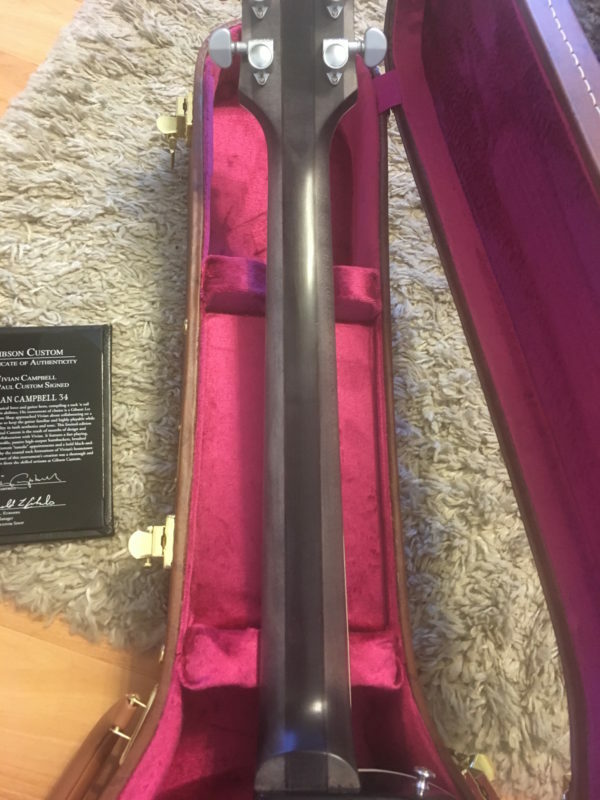 By 1960, this evolved into the SlimTaper neck. 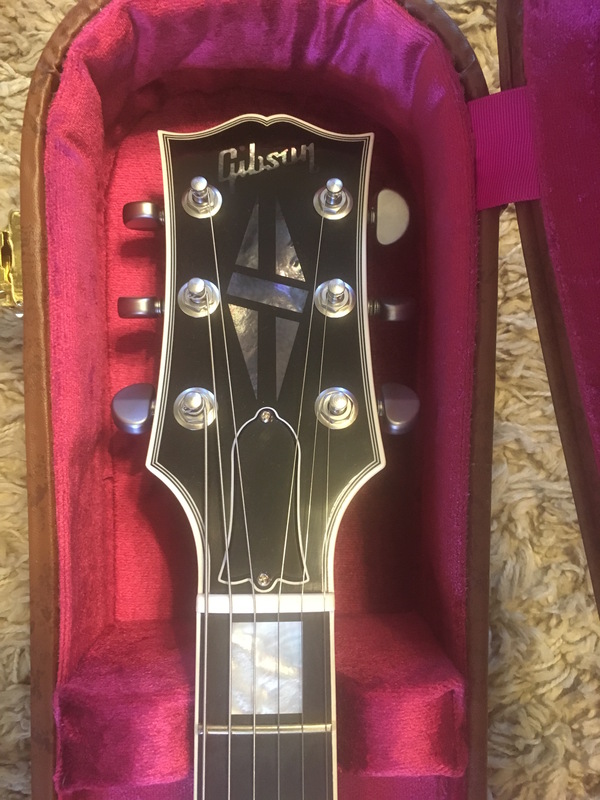 Necks stayed thin in the ’70s, and Gibson moved from their traditional 1-piece mahogany design to a stronger 3-piece maple one. 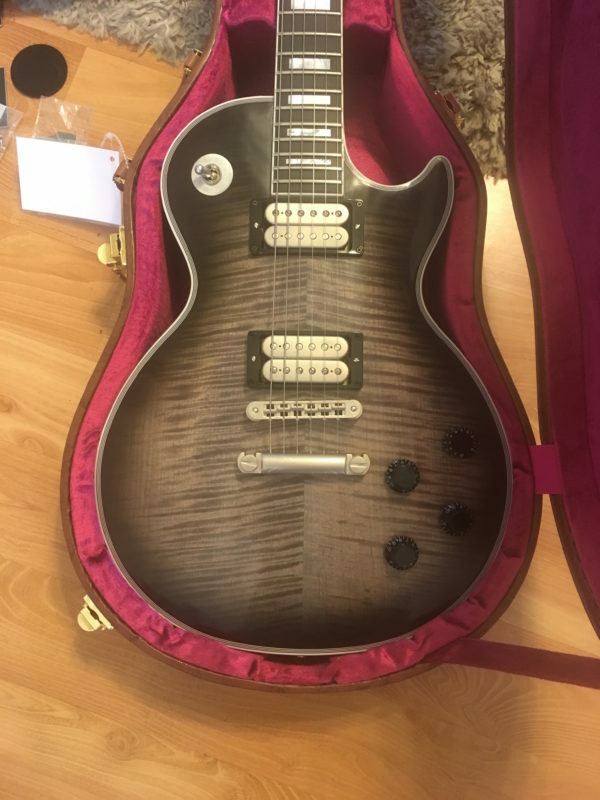 The Vivian Campbell Les Paul Custom takes this design even further with a 5-piece maple/walnut neck and a long neck tenon for added sustain, clarity, and resonance. At Sweetwater, we can’t believe how comfortable this neck is. Whether you’re chording down low or riffing up high, this neck — with its richlite fingerboard and pearl block inlays — always feels just right! The Vivian Campbell Les Paul Custom features a DiMarzio Super Distortion humbucker in the bridge position and a Super 3 at the neck. The Super Distortion is one of DiMarzio’s earliest pickups, and it’s designed to send your tube amp straight into overdrive, thanks to its ultra-high output. The Super 3 sounds similar but boasts more midrange grind and a chopped high-end that’s tailor-made for players who love high-gain amps and scooped mids. Both of these pickups deliver huge tones with humbucker-signature thick mids, fat highs, and killer lows. Renowned for his blistering-fast solos and explosive style, Vivian Campbell began playing guitar at the age of 12. After getting his feet wet in the British heavy metal band, Sweet Savage, Vivian Campbell joined Ronnie James Dio’s eponymous band in the early 1980s. Vivian also played in Whitesnake, Riverdogs, and Shadow King before succeeding Steve Clark in Def Leppard. As a lifelong fan of Thin Lizzy (and their guitarist Gary Moore in particular), Vivian had the distinct honor of joining their ranks in 2009. He also showcases his impressive guitar skills as a member of Last in Line. The Vivian Campbell Les Paul Custom is loaded with character and does a tremendous job of capturing Vivian’s unique individuality. 2012 Fender Custom Shop 1960 Relic Stratocaster Matching Headstock-Olympic White.